One of Cushion’s most appealing features is its ability to reveal insights about your clients. Cushion uses basic data from projects and invoices to calculate useful info, like average budget or typical wait time for payment. While these data points are good to know, there’s so much more we could learn about clients. In this update, we introduce two new sections that provide even more insight—a schedule view and a budget view for individual clients. The first new insight is ranges for averages. Below each average-based insight on the client views, Cushion will now indicate the high and low of the given value. For example, instead of only seeing a client’s average project income, you will now see the highest and lowest project income for that client. Client ranking is a completely new feature that brings us one step closer toward a grading system for clients. Based on specific criteria, Cushion will rank your clients against one another. 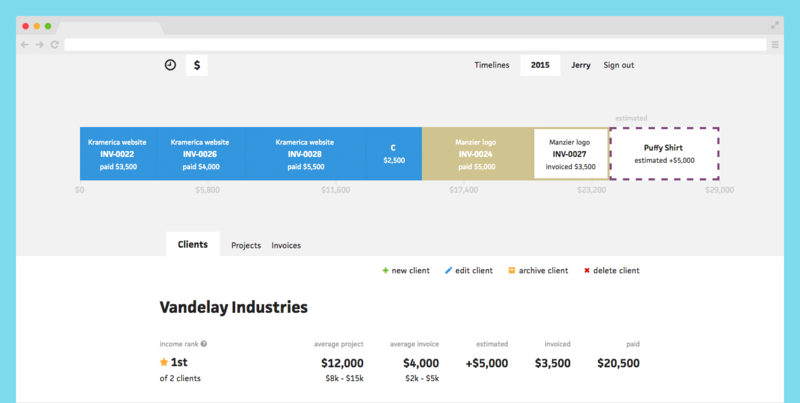 The schedule view ranks clients based on their combined average delay and drag. If a client of yours is always on time, they will stand above all others with a gold star! The budget view ranks clients based on their total income. If a troublesome client is a bummer to work with and they rank last in income, you might want to reconsider them as a client. We hope these new features reveal even more about your clients, so you can anticipate sticky situations before they happen.